What is a Solitary Pulmonary Nodule? A solitary pulmonary nodule (SPN) is a single abnormality in the lung that is smaller than 3 cm in diameter. Generally, a pulmonary nodule must grow to at least 1 cm in diameter before it can be seen on a chest X-ray film. A solitary pulmonary nodule is surrounded by normal lung tissue and is not associated with any other abnormality in the lung or nearby lymph nodes (small, bean-shaped structures found throughout the body). Persons with solitary pulmonary nodules usually do not experience symptoms. Solitary pulmonary nodules are usually noticed by chance on a chest X-ray film that has been taken for another reason (referred to as an incidental finding). Solitary pulmonary nodules are one of the most common abnormalities seen on chest X-ray films. Approximately 150,000 cases are detected every year as incidental findings, either on X-ray films or CT scans. Most solitary pulmonary nodules are benign (noncancerous); however, they may represent an early stage of primary lung cancer or may indicate that cancer is metastasizing (spreading) from another part of the body to the lung. Determining whether the solitary pulmonary nodule seen on the chest X-ray film or chest CT scan is benign or malignant (cancerous) is important. Prompt diagnosis and treatment of early lung cancer that presents as solitary pulmonary nodule may be the only chance to cure the cancer. Inflammatory (infectious): Granuloma (small, granular inflammatory lesions) These usually involve an exposure to an infectious agent. This agent is difficult for the body to completely remove so the immune system attacks trying to wall it off. Because the immune cells are coming from all angles, the resultant biproduct is a rounded nodular density, an solitary pulmonary nodule. Occasionally, a shadow seen on X-ray from an overlying object lying on the back or the chest may be mistaken for an solitary pulmonary nodule. Similarly, when several objects, such as blood vessels, lymph nodes, and or ribs overlap, the result can seem like a nodule or mass on chest X-ray when one does not really exist. Most persons with solitary pulmonary nodule do not experience symptoms. Generally, solitary pulmonary nodule is detected as an incidental finding. Approximately 20% to 30% of all cases of lung cancer appear as solitary pulmonary nodules on chest X-ray films. Therefore, the goal of investigating an solitary pulmonary nodule is to differentiate a benign growth from a malignant growth as soon and as accurately as possible. Solitary pulmonary nodules should be considered potentially cancerous until proven otherwise. People should always communicate openly and honestly with their health care professional about their history and risk factors. The following features are important when assessing whether the solitary pulmonary nodule is benign or malignant. Age: Risk of malignancy increases with age. Smoking history: A history of smoking increases the chances of the solitary pulmonary nodule being malignant. Prior history of cancer: People with a history of cancer in other areas of the body have a greater chance that the solitary pulmonary nodule is malignant. Occupational risk factors for lung cancer: Exposure to asbestos, radon, nickel, chromium, vinyl chloride, and polycyclic hydrocarbons increases the chance that the solitary pulmonary nodule is malignant. Travel history: People who have traveled to areas with endemic mycosis (for example, histoplasmosis, coccidioidomycosis, blastomycosis) or a high prevalence of tuberculosis have a higher chance of the solitary pulmonary nodule being benign. People who have a history of tuberculosis or pulmonary mycosis have a greater chance of the solitary pulmonary nodule being benign. Anemia (low levels of hemoglobin) or an elevated erythrocyte sedimentation rate (speed at which red blood cells settle in anticoagulated blood) may indicate an underlying cancer or an infectious disease. Elevated levels of liver enzymes, alkaline phosphatase, or serum calcium may indicate that the solitary pulmonary nodule is cancerous and spreading or that cancer is spreading from other parts of the body to the lung. Persons who have histoplasmosis or coccidioidomycosis may have high levels of immunoglobulin G and immunoglobulin M antibodies specific to these fungi. A tuberculin skin test is a simple skin test used to help determine whether the solitary pulmonary nodule has been caused by the bacteria Mycobacterium tuberculosis. The test involves injecting the tuberculin antigen (a substance that triggers the immune system to produce cells [antibodies] that attack and try to destroy the antigen) into the skin and observing the body's response. If the solitary pulmonary nodule has been caused by tuberculosis, the injection site swells and reddens. Because solitary pulmonary nodules are first detected on chest X-ray films, ascertaining whether the nodule is in the lung or outside it is important. 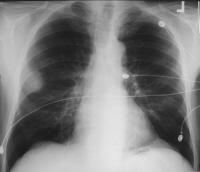 A chest X-ray film taken from a lateral (side) position, fluoroscopy, or CT scan may help confirm the location of the nodule. Although nodules of 5 mm diameter are occasionally found on chest X-ray films, solitary pulmonary nodules are often 8-10 mm in diameter. The most important step is determining the possibility and risk of the solitary pulmonary nodule being malignant. Patients who have an older chest X-ray film should show it to their health care professional for comparison. This is important because the growth rate of a nodule can be ascertained. The doubling time of most malignant solitary pulmonary nodules is 1 to 6 months, and any nodule that grows more slowly or more rapidly is likely to be benign. Chest X-ray films can provide information regarding size, shape, cavitation, growth rate, and calcification pattern. All of these features can help determine whether the lesion is benign or malignant. However, none of these features is entirely specific for lung cancer. 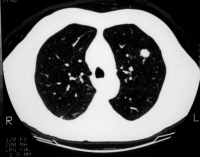 Radiologic characteristics that may help establish the diagnosis with reasonable certainty include (1) a benign pattern of calcification, (2) a growth rate that is either too slow or too fast to be lung cancer, (3) a specific shape or appearance of the nodule consistent with that of a benign lesion (round smooth borders, cancers may have a so-called stellate [star shaped] pattern), and (4) unequivocal evidence of another benign disease process. Better resolution: Nodules as small as 3-4 mm can be detected. Features of the solitary pulmonary nodule are better visualized on CT scan, thereby aiding the diagnosis. Better localization: Nodules can be more accurately localized. Areas that are difficult to assess on chest X-ray film are visualized better on CT scan. CT scan provides more details of the internal structures and more readily shows calcifications. If the CT scan demonstrates fat within the nodule, the lesion is benign. This is specific for a benign lesion (i.e., hamartoma). CT scan helps distinguish between a neoplastic abnormality and an infective abnormality. Malignant cells have a higher metabolic rate than normal cells and benign abnormalities; therefore, the glucose uptake of malignant cells is higher. Positron emission tomography (PET) involves using a radiolabeled substance to measure the metabolic activity of the abnormal cells. Malignant nodules absorb more of the substance than benign nodules and normal tissue and can be readily identified on the 3-dimensional, colored image. Unfortunately, recent data suggests that pet scanning may not be as useful as once thought as a routine screening tool. These studies have a significant false positive rate (the test indicates a potential malignancy, although none is present ) which can lead to unnecessary and potentially harmful biopsy..
PET scan is a noninvasive exam, but the procedure is expensive. Single-photon emission computed tomography (SPECT) imaging is performed using a radiolabeled substance, technetium Tc P829. SPECT scans are less expensive than PET scans but have comparable sensitivity and specificity. However, the test has not been evaluated in a large number of persons. In addition, the SPECT scans are less sensitive for nodules smaller than 20 mm in diameter. Biopsy is a sample of cells is removed for examination under a microscope. There are different methods to collect biopsy samples from the airway or lung tissue where the solitary pulmonary nodule is located. Bronchoscopy: This procedure is used for solitary pulmonary nodules that are situated closer to the walls of the airways. A bronchoscope (a thin, flexible, lighted tube with a tiny camera at the end) is inserted through the mouth or nose and down the windpipe. From there, it can be inserted into the airways (bronchi) of the lungs. During bronchoscopy, the health care professional takes a biopsy sample from the solitary pulmonary nodule. If the lesion is not easily accessible on the airway wall or is smaller than 2 cm in diameter, a needle biopsy may be performed. This procedure is called a transbronchial needle aspiration (TBNA) biopsy. Usually, this technique is only successful with the aid of endobronchial ultrasound (EBUS). Transthoracic needle aspiration (TTNA) biopsy: This type of biopsy is used if the lesion is not easily accessible on the airway wall or is smaller than 2 cm in diameter. If the solitary pulmonary nodule is on the periphery of the lung, a biopsy sample has to be taken with the help of a needle inserted through the chest wall and into the solitary pulmonary nodule. It is usually performed with CT guidance. With solitary pulmonary nodules larger than 2 cm in diameter, the diagnostic accuracy is higher (90% to 95%). However, the accuracy decreases in nodules that are smaller than 2 cm in diameter. Once an solitary pulmonary nodule is determined to be benign, no further workup is necessary. However, one must always consider the overall clinical situation. In some cases, such as in cigarette smokers further monitoring of the lungs may be necessary. Persons with a malignant solitary pulmonary nodule: Persons who have been diagnosed with a malignant solitary pulmonary nodule based on the results of the exams and tests should have the nodule surgically removed. Persons with solitary pulmonary nodule that cannot be classified as either benign or malignant: Most persons fall into this category. This is a very challenging population, and often can be followed by serial CT scans monitoring for change or stability of the solitary pulmonary nodule over a two year period. The solitary pulmonary nodule should be surgically removed in patients who have a moderate-to-high risk for cancer and clinical signs that indicate that the nodule is malignant. Solitary pulmonary nodule is removed surgically by either thoracotomy (open lung surgery) or a video-assisted thoracoscopic surgery (VATS). Thoracotomy involves making a cut in the chest wall and removing small wedges of lung tissue. Patients undergoing this procedure are usually required to stay in the hospital for several days afterward. This procedure has a small risk for mortality in patients with low surgical risk. Video-assisted thoracoscopy is performed with the help of a thoracoscope (a flexible, lighted tube with a tiny camera at the end) inserted into the chest through a small cut on the chest wall. The camera displays the image on a TV screen, and the surgeon uses the display to guide the operation. Its advantages over thoracotomy include a shorter recovery time and a smaller incision. Most solitary pulmonary nodules are benign, but they may represent an early stage of lung cancer. Lung cancer survival rates remain low at 14% at 5 years. However, early lung cancer (i.e., lung cancer that is diagnosed when the primary tumor is smaller than 3 cm in diameter [stage 1A]), can be associated with a 5 year survival rate of 70% to 80%. Accordingly, the only chance for cure of early lung cancer that presents as solitary pulmonary nodule is prompt diagnosis and treatment. The AMC Cancer Information and Counseling Line provides current medical information and counseling for cancer issues. The National Coalition for Cancer Survivorship is a survivor-led advocacy organization working exclusively on behalf of people with all types of cancer and their families. X-ray film of a large, well-circumscribed mass in the periphery of the right upper lobe. The mass was later was determined to be a neurilemoma. Click to view larger image. A 1.5-cm coin lesion in the left upper lobe in a patient with prior colonic carcinoma. Transthoracic needle biopsy findings confirmed this to be a metastatic deposit. Click to view larger image. What was the cause of your solitary pulmonary nodule?